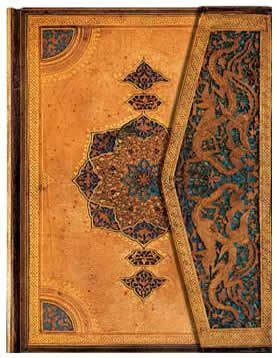 Amid the many jewels of ancient Islam, decorative book binding shines particularly bright. Symmetry and refinement of line are the hallmarks of these bindings, which range in style over many centuries from the simply tooled geometric patterns of the 14th century to the complex compositions of the 16th century. Associated with the Islamic Golden Age, the Persian Safavid-style designs represented a high point in the art of the book. These bindings feature centralized designs of medallions, quadrants and plant and animal motifs, a pentagonal envelope flap closure and elaborately decorated doublures (interior covers), exquisite creations in cut-out leather, coloured papers and gilding. Our doublure-inspired collection portrays a remarkable leather filigree pattern incorporating handtooled surfaces and motifs that retain an elegance and style even in our modern context.